Designed to catch some of the smaller fishes of the sea, cray pots and buoy lines managed to trap one of the world's biggest animals: a humpback whale. 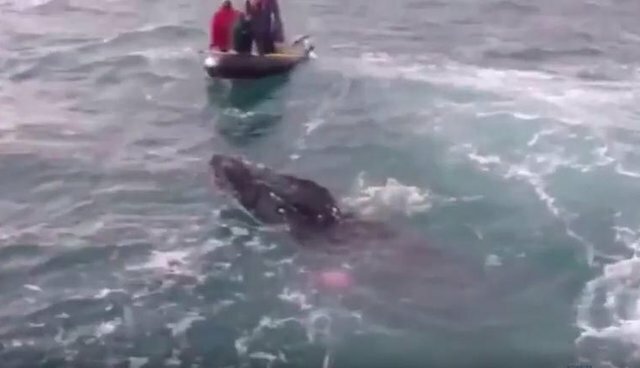 Tangled and distressed, the baby whale was spotted off the coast of New Zealand on Sunday by a group of fishermen, who reported the sighting to local police. 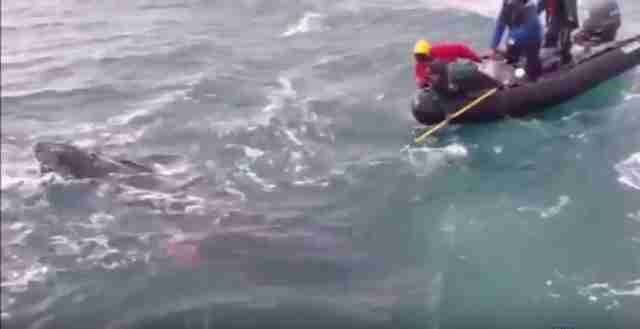 Luckily for this baby, New Zealand's Department of Conservation sent out a specialist whale rescue team who traveled nearly 100 miles to reach the trapped whale. After four and a half hours of untangling and cutting away at the rope, the team managed to free the whale. "They cut the lines off him and he swam away out to sea and he seemed pretty happy," Kyle Smith, of the Wellington Police maritime unit, told StuffNZ. Whales frequently get caught in netting and fishing supplies. Just last week, a blue whale was reported to be tangled off the coast of southern California. The aftermath of this scenario can be devastating for whales, who can lose their tails or even die as a result of entanglement. If you ever come across a tangled whale or sea animal, contact the U.S. Coast Guard or call the National Oceanic and Atmospheric Association's 24/7 hotline at 1-800-853-1964. If you spot a whale in the Northwest oceans, call 1-877-SOS-WHALE (1-877-767-9425).